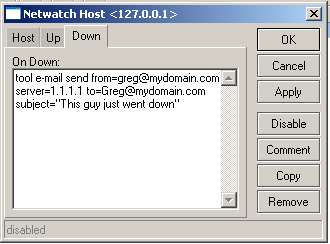 The question was, can I ping a host and then have the Mikrotik email me when it goes down/up. The answer is yes. If you use a little tool called netwatch. An example script you can run is one that will email you. 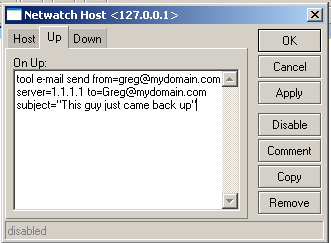 /tool netwatch add comment="" disabled=no down-script="tool e-mail send from=greg@mydomain.co\ m server=1.1.1.1 to=Greg@mydomain.com subject=\"This guy just went down\"" \ host=127.0.0.1 interval=1m timeout=1s up-script="tool e-mail send from=gre\ g@mydomain.com server=1.1.1.1 to=Greg@mydomain.com subject=\"This guy just\ \_came back up\""
Great! Thanks! your web its so informative about mikrotik!